The newly-refurbished, state-of-the-art Leatherhead-based headquarters of Wates Group received a royal visitor today, as HRH The Princess Royal presented the company with The Queens Award for Enterprise, Sustainable Development. 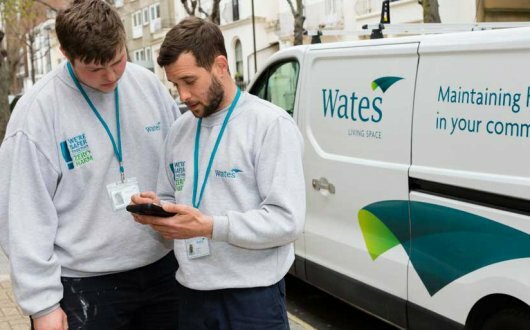 Teams from Wates Smartspace worked round the clock to ensure months of work were completed in time for Her Royal Highness, as she arrived at a special reception to present the company with the Award, the second time in the company’s history. The Award was made in recognition of the Group’s work with social enterprises, as well as its commitment to providing training and employment opportunities for young people, particularly apprentices and people from disadvantaged backgrounds. The company previously received The Queen’s Award in 2011. The Princess Royal met employees from all parts of the business, as well as representatives from Community Wood Recycling, a social enterprise which has worked with Wates since 2010, recycling more than 1,000 tonnes of wood waste. It is an honour for Wates Group to have received this award, recognising our work in Sustainable Development. We believe that good business, well done, is a force for good in society. I am proud that it is ingrained in the company’s culture. The Princess Royal later unveiled a plaque, marking her visit to the renovated headquarters.